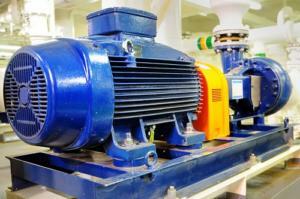 Do you manufacture pumps or compressors? Do you want some ideas on how to test them? The goal here is to describe the testing at a level above the physical attributes, such as temperature, pressure, force, and so on, but below the level of a final assembly inside of which the pump or compressor resides. This region is bounded by murky lines, but staying at this level enables tangible comments. Pumps and compressors are used widely in moving gases and liquids, such as for delivery to a pipeline, preparation for chemical processing, air conditioning for buildings and vehicles, fuel delivery for combustion engines and turbines, and so on. Power consumption Electrical: current & voltage; Mechanical: fuel flow meter. Note: Centrifugal compressors are often described along with centrifugal turbines, since both use a series of blades to input energy into the fluid or extract energy out, respectively. Consequently, both types of machines have similar features to test. Reciprocating compressors, with their use of pistons and valve, have uniquely different operational modes than centrifugal units. Nevertheless, the same types of tests are also applicable, along with a set of measurements suited for cyclic operation described by the angle of a crankshaft. Pumps also come in a huge variety, and yet these same types of measurements still apply. The multiple designs available for all these types of machines makes the exact types of tests and measurements specific to the machine. Thus, the list of test features above is generic. Yet since they are all moving some type of fluid (gas or liquid) from an inlet to an outlet, they all have thermodynamic and mechanical properties that need to be checked. Consequently, the term pump will be used in the section to mean a machine that moves fluid, whether it is a compressor, turbine, pump, and either centrifugal or reciprocating. An interesting aspect of pump and compressor testing is that many tests are performed to standards from, for example, API (American Petroleum Institute), ANSI/HI (Hydraulic Institute), and ASME (American Society of Mechanical Engineers). Many of these tests require back pressure or vacuum to be applied so the device has something to “push” or “pull” against. Such loads are often either gravity (e.g., for head pressure or vacuum) or a set of pipes, baffles, and valves (to provide flow resistance) or other means to dump the mechanical energy in the flow. The amount of power used to drive the pump is determined by either the same method described in our article on test methods for electric motors or a use of a volume or mass flow meter to measure the amount of fuel consumed by an engine. Conversion factors need to be applied to both measurements to allow for the actual efficiency of the motor/engine delivering power to the pump. That conversion is complex and not discussed here. As with motors, the power transfer efficiency for the pump is sought. However, a pump is much more complex in that the transfer performance depends on the state of the input fluid, e.g., the pressure and temperature, and compressibility. Characterization is multivariate. The standards mentioned earlier were consequently developed since they allow all pump manufacturers to test under the same conditions. For centrifugal pumps, applying an accelerometer to a bearing mount can be used to assess the mechanical integrity of the bearing. Excessive vibration indicates bearing failure and the frequencies of those vibrations are indicative of the types of faults, such as bad roller bearing elements or overall looseness due to worn out elements. When two axes are measured simultaneously, say vertical and horizontal as defined by gravity, an overall mount movement can be detected if either the bearing or the mount is moving. These frequencies occur proportional to the rotational speed. Vibration can also be caused by either shaft misalignment or weight asymmetry, whether in the shaft or blades, and this asymmetry causes rotational forces proportional to the rotational speed. For reciprocating or cyclic machines, the vibration frequencies occur at the crankshaft rotational rate or natural frequencies in the mechanical vibration of the equipment, such as an intake valve in a reciprocating compressor. Shaft and component alignment checked by a proximity sensor can be used to verify that mechanical tolerances are being met. In reciprocating and cyclic machines, it is often advantageous to measure vibration and proximity as a function of angle, rather than the usual time-based measurements. A keyphasor or N/rev sensor allows the angle-based data to be aligned to a “zero degree” position in the cycle so that measurements can be associated with the position of moving parts. For example, the vibration caused by an intake valve will occur at a different angle in the cycle than an exhaust valve. Sensors used are listed in the table above and applied to various components used to construct the pump, such as the housing, bearings, and so on. The type of sensor to use is usually chosen based on the required accuracy, with RTDs being the best. Careful calibration and precision signal conditioning is important to get the highest accuracy from temperature sensors due to their small signal output. Measurement of the pressure, temperature, and flow rate of the input and output fluid is required to perform the thermodynamic calculations to verify the compressive properties of the pump or compressor. The accuracies associated with these measurements are often very small, since small errors in each variable combine to a larger error in the computed output. Precision sensors are often used and then calibrated rigorously. If a pump can move fluid towards the outlet faster than the input can supply fluid, a strong vacuum can be created and cavitation may occur. This situation can be detected with either an accelerometer or an acoustic microphone because the “pinging” of the cavitation bubbles cause vibration in the housing. Tests are sometimes performed to understand the operational envelope under which cavitation can be prevented, but much depends on the characteristics of the input fluid. Pumps and compressors can be loud. Some manufactures test the acoustic energy created by the machine at various operating conditions. Acoustic microphones combined with standardized auditory tests to convert sound pressure into dBA levels are used for potential hearing damage assessment. Since pumps move fluid under pressure, seals are required around any rotating shafts. The amount the seals leak can often be measured under static conditions (shaft not rotating) with a flow meter or pressure sensor to look for fluid loss or pressure decay. Performing this type of test under dynamic conditions is challenging but is often useful since vibration and shaft alignment issues can cause the seal to leak more when the pump is operational. Also, a liquid working fluid may be replaced with air for a leak test with the air pressure increased to the PSI at which the liquid would be used in normal operation, and realizing that for the lower viscosity of air will result in a leakage rate larger than that of the fluid. If you need custom test equipment to test your pump or compressor or just have a question about automated test of pumps or compressors, reach out here to start the discussion.